Culture is strongly bound with language, food and beverages. Every good traveler knows that it is essential to taste and sip local delicacies. The story behind the national drinks of different cultures can be amazing. In Turkey, mystical cloudy “rakı” takes the center stage. Once tried, travelers are guaranteed to remember the strong anise aroma of this powerful spirit. For Turks drinking rakı is not about getting drunk. Drinking rakı is a ritual. It is a social amalgamate leading to feeling of well-being, openness, sharing and reflecting. It also boosts creativity. 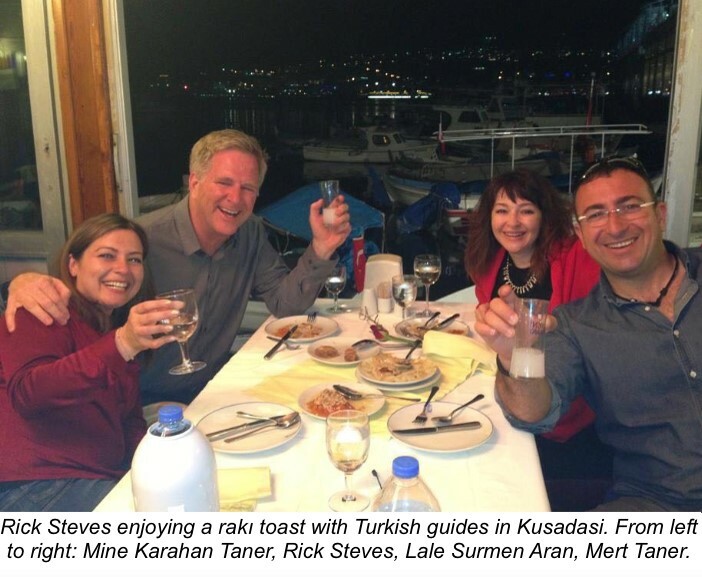 Eastern Mediterranean cultures and former Ottoman Empire realm aren’t indifferent to rakı or other anisettes. Turkish rakı stands out on several accounts, from production to history and culture interwoven with it’s consumption. 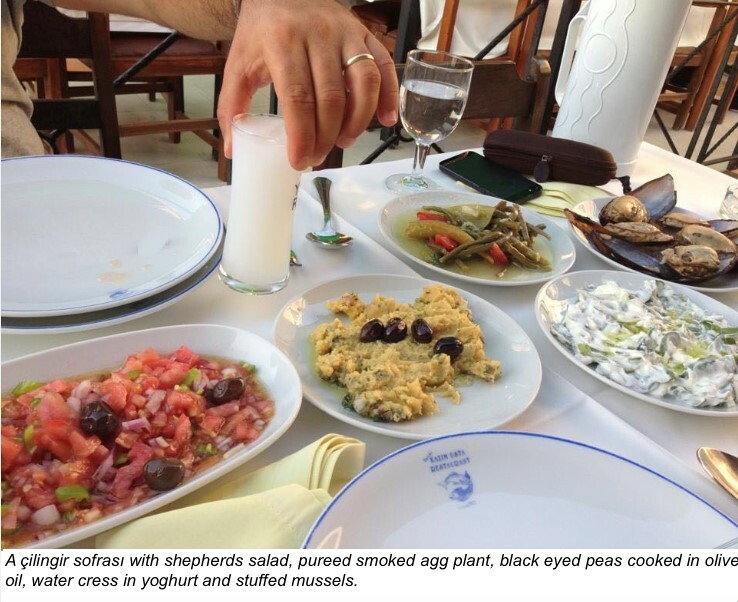 While anisettes are considered to be preludes to meals, an entire cuisine has developed to accompany the rakı. Rakı is all for the Turks, it is a pre-dinner drink, a drink to go with your dinner and a digestive after the dinner! Who made the first rakı is unknown, but it is not wrong to say that it wasn’t invented but formed over time. It is obtained by double distilling the raisins and aging in oak barrels for two to six months, than filtered to remove any color. Rakı is served in a narrow tall glass. First a shot of rakı is poured in the glass, then 2 parts water is added, this turns the clear color of the drink to a cloudy form. This is caused by the insoluble essential oil found in aniseed called anethol. Rakı is intended to be consumed diluted, when this is appropriately done, it is no stronger than a glass of wine. Meyhane, the house of wine, is the congregation place of the rakı connoisseurs. Meyhanes are not bars, or clubs, but restaurants which are prepared with a strong kitchen to serve a long and tasty dinner to clients, staring with the mezes, tiny dishes of savory appetizers. A “rakı masası” or rakı table is always dressed family style, everyone shares the food, this leads to an ideal “rakı muhabbeti”, this means rakı with sincere, affectionate and friendly conversation. Regardless of differences in vocation, education, culture and ethnicity, people blend in meyhanes and they are equally treated. Essence of drinking raki is consuming moderate quantities, slowly savoring the moment, the food, unwinding your thoughts, the relaxation and enjoying a nice conversation. Rakı relaxes even the most reserved person to join the conversation, hence the other name for the rakı masası is the “çilingir sofrası” or the locksmith’s table. It has the magical power to lift barriers and open social doors. 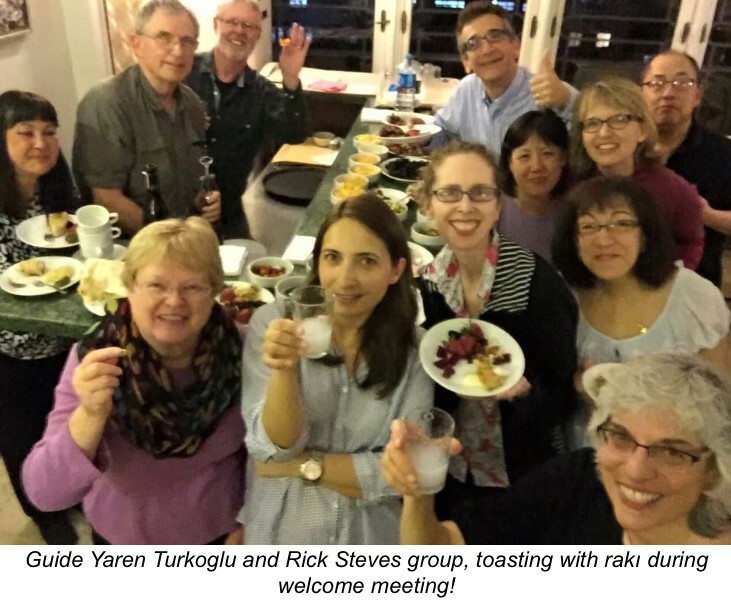 That’s why a rakı gathering is a social, cultural group therapy. You might save the world from political conflict or become a healer to your friend abandoned by her lover. Last but not least, rakı is also a healer’s medicine. Most interesting use is rubbing kids with aspirine melted rakı to reduce the fever. Rakı: Unsweetened, anise flavored distilled alcoholic beverage. Pronounced as rah-kuh. Meyhane: Direct translation is house of wine, as it is how it started centuries ago under the Ottomans. Rakı came to be consumed in meyhanes more than wine after the 19th century. Pronounced as may – hah –neh. Rakı Masası: Dinner table set for enjoying a rakı dinner. In the 16th century, it was the norm to have 45 different types of mezes! Pronounced as rah-kuh mah-sah-suh. Şerefe: Cheers! Essentially means to your honor! Pronounced as sheh-reh -feh. Meze: Tiny dishes of savory appetizers. Pronounced as meh-zeh. Aslan Sütü: Aslan means lion and süt means milk, so the term literally translates as the “milk for lions”. 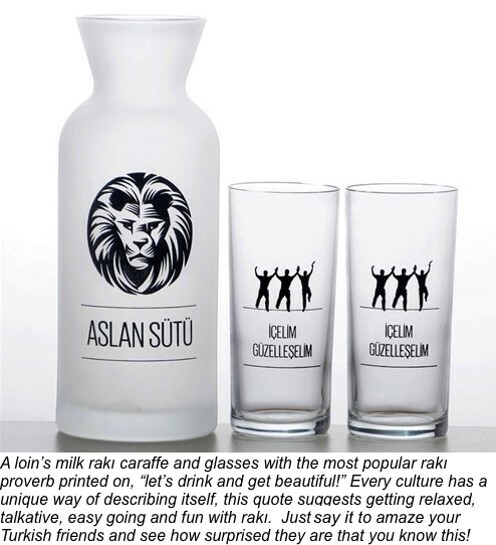 Courages and strong people are described as aslan in Turkish, “aslan sütü” honors the rakı consumer for bravery! by Lale Surmen Aran & Mert Taner. Photo credits: Lale Surmen Aran, Mine Karahan Taner, Taylan Tasbasi, Yaren Turkoglu.